But in all seriousness, I do actually dig the design. I also like that the powerup mode uses gold rather than blocking out his signature color like what happens with the others in their powerup modes. Whoa, if I'm interpreting the pictures right, RyusoulGold's sword can move like a saw. I am SOLD, I like him. As much as I do think we could've used a different color than just Gold, I don't mind, especially since I do like the gold/navy combination a lot and it is a genuinely pleasing palette. And I like that he has an armored mode of his own, too, that way he can fit in as both a "normal" Ryusoulger and stand out as the sixth ranger. Hope we'll see his mecha soon. DimeVolcano and the powerup armor it gives look pretty cool, too! I always dig heavy artillery forms like that. Wonder how this will affect the suit, since it'd be pretty heavy on the shoulders. Gold's gun/henshin device, whatever it is, looks like it borrowed cues from the "Tyrannosaurus Dinozord" in the MMPR movie. I'm using quotes because it looked nothing like a Tyrannosaurus. DimeVolcano is very odd, usually a Sixth gets their own humanoid mech but they're being rather unconventional here, though the combination with KishiryuOh is pretty damn cool. Red being able to use a unique armour like Gold is somewhat... 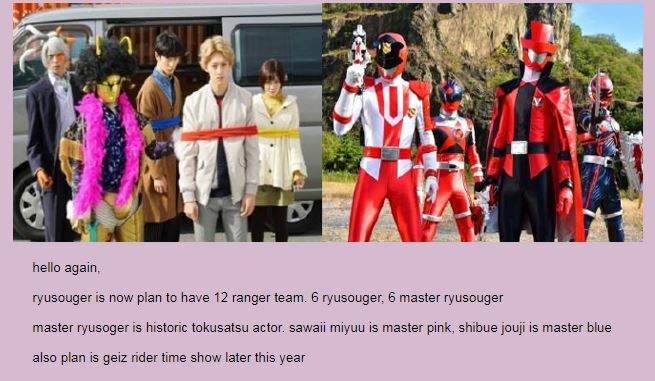 Concerning to me considering how Red-centric Sentai can get but I'm going to wait for the writing team to do their stuff before I cast my judgement on that. DimeVolcano's not RyusoulGold's mech, it's an extra mech along the lines of like, Ankydon or Bunpachy from Kyoryuger, or Dimenokodon or Ankyloveilus from Abaranger. No scans for RyusoulGold's mech yet, but it seems like it's gonna be based on a Mosasaurus. It's just that DimeVolcano also comes with a unique armor power up that sounds like it'll be able to be used by all of the Ryusoulgers, but for now it's only pictured with RyusoulRed. How many colours do you think in the group?